Sir Winston Leonard Spencer Churchill, British statesman, author and Conservative Prime Minister (1940-45, 1951-55), rallied the British people during World War II. He was awarded the Nobel Prize for Literature in 1953, the same year he received his knighthood. Churchill was a regular lodge attender, although not an office holder, until his resignation in July, 1912. In 1918 he signed an unsuccessful petition for a new lodge to be called the Ministry of Munitions Lodge and, in his only other recorded masonic contact, he visited Royal Naval Lodge No. 59 on December 10, 1928. Anti-masonic claims to the contrary, there is no documentation extant that Churchill publicly renounced Freemasonry. Source: Lodge records. See: MQ, "Brother Winston," Yasha Berisiner. Issue 3, October, 2002, p. 6: "An unfortunate communication in 1955 by the then librarian of Grand Lodge, W. I. Grantham, to his counterpart in Iowa, USA has led to the erroneous reports that Churchill was raised in Rosemary Lodge No. 2851." Churchill "resigned from Studholme Lodge in July 1912, but continued his membership in the Craft." John Jackson, ed. MDA Communications, London. 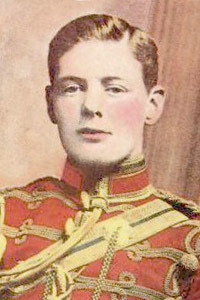 Denslow later reported that Churchill was raised in Rosemary Lodge No. 2851. Also see Laurence Geller, Chicago.